Without treatment, gum disease can threaten the health of your smile, as well as the stability. Fortunately, you can take steps to help avoid the onset of the disease. 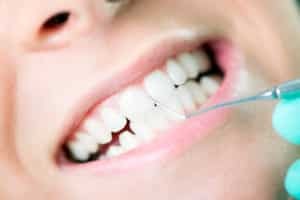 If you begin to show signs of gingivitis (gum inflammation) we can offer preventive treatments to reduce your risk, such as a periodontal deep cleaning. Do you need a deep cleaning? Question: What are the warning signs of gingivitis? Answer: Gum inflammation can occur as a result of poor oral hygiene causing plaque buildup, smoking, and certain chronic illnesses. Common warning signs include soreness or redness in the gum tissue, as well as bleeding when brushing and flossing. If you experience discomfort or bleeding in your gums, then talk to your periodontist. Addressing the problem in the inflammation stage can potentially prevent the onset of gum disease. Question: What does a deep cleaning involve? Answer: A traditional cleaning involves removing plaque buildup from the surface of the teeth and polishing the teeth afterward. If you have the warning signs of gingivitis or the early stages of gum disease, you may need a deep cleaning. The doctor will use scaling and root planing to remove plaque and tartar from the surface of the teeth and from under the gums. Question: Do I still need dental cleanings? Answer: Yes. After your scaling and root planing you should still undergo routine preventive visits once every six months. However, if you have high risk factors for periodontal problems we may suggest a cleaning once every three to four months. Question: How do I protect my smile from home? Answer: You should always brush your teeth twice a day and floss once before going to bed. Sound simple? It is. With the right steps you can help safeguard your smile against common oral health concerns.